On Saturday Steve got to baptize Junior Kaho. I was at home with the kids, still recovering from being sick. We took the kids to the park but they weren't in the best of moods and didn't feel great. For the last two and half weeks we have all been taking turns being sick. We had colds and fevers, then bronchitis, then throwing up stomach problems, then pink eye, and then we were feeling better until after a visit to the pediatrician's office where we most likely picked up another cold virus. Steve would like to point out that he's been feeling great. Hailey loves climbing the rocks. Hailey reminds me a lot of my sister Clarice. Here ducks.... want my sandwich??? After the park we had lunch with my family and then we took our crabby, grumpy kids home. This is lettuce we started growing in January - it's finally ready to eat 5 months later! Steve's dad Scott got all the women flowers... they look beautiful. Steve is having a necklace made for me that should be here in about 6 weeks. My parents just got back this afternoon from cruising Alaska. I asked my mom to bring me back some jam. I didn't think she would remember but she did. We thought we would be cool and test out all the different milk alternatives. I think everyone one likes the almond the best. Mother's day meant we got to talk to my sister in Cambodia. We actually Skyped and managed to get all my siblings on. Decided to test out the fruit roll up maker on the dehydrator Scott and Lynda got me for my birthday. We gobbled them up in as soon as they were dry. This is what my floor usually looks like. Love the chubby little feet. They actually like to hold hands....so cute. Hanging out at Magic Mountain with the McClellan family for cousin Brianna's birthday. Even Evan wants to go on the rides. We were all melting to death out here in the high nineties.... ridiculous hot heat! Playing in the ball house. Hailey almost got smashed to pieces here. And birthday cake for Jeni and Greg too...YUM! I decided that for my 30th birthday I wanted to go away for the weekend with the family. That meant I wanted to get out of the city and go somewhere that would be fun and entertaining for everyone. We decided to go to Solvang. Steven had never been to Solvang before so I thought this would be great. Solvang is part of Santa Barbara County. My dad used to take our family camping nearby at Lake Cachuma and we would come into Solvang for the day. Friday morning we woke up and opened up birthday cards that came in the mail and birthday presents from my family. It's a good thing I had my little assistants who helped open everything. I appreciate each and every one of my siblings calling personally and wishing me a happy birthday. Even though we don't live close it's nice to know they care. Okay Hailey, time to get up. We had good luck bidding for our hotel on Priceline. We got it for half cost and it turned out to be a great hotel. Jacuzzi tub, good breakfast, comfy bed... what more do you want? Evan started walking on Wednesday and now he just wants to walk everywhere. Yep, life is never going to be the same anymore. Our first stop was to this really cool fairytale themed park I read about online. Much cooler than any of the public parks in Los Angeles. Want to sail a viking ship? You can ride the horses. This is the little Hansel and Gretel gingerbread house. She found the water mister. Nothing like the Old West wing of the park. Swinging in the tire swing. There were tons of areas to climb on and secret hiding spots scattered all over. There were plenty of covered picnic and barbeque areas. It was pretty hot up there. Had to keep hydrated. They even had a little puppet theater with a mini stadium seating section to sit on. The valley out there is covered in beautiful vineyards and farms.... reminds me alot of Tuscany. 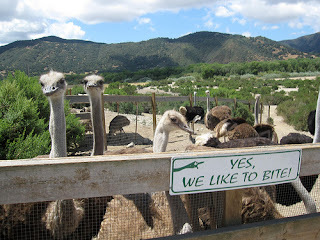 Our next stop that morning was to Quicksilver Miniature Horse Ranch. I know -- have you ever seen such a cute mini horse? They sell for about $2500. "Bigger than a breadbox but smaller than a great dane, minature horses rarely reach waist high. They are not ponies or dwarf varieties. To be registred the animals height must not exceed 34 inches." Not even 24 hours old! This horsie would be perfect for Evan. This little one was born yesterday. This ranch is free to walk around and talk with the workers. After that we headed to the Clairmont Lavender Farm. The flowers will be in full bloom later this month for about 3 months. "Will this make my kids go to sleep quicker?" Here is the distuller. They make everything in their store by hand. Our next stop down the road was to the Seeing Spots Donkey Farm. The owners take in a lot of abandoned animals, that go in a petting zoo for visitors. They did not have a set fee that they charge... they just ask for a donation. This black baby goat is only 5 days old. Little baby goat was super super friendly. He wanted to eat her dress. They also had a zonkey: a donkey bred with a zebra. We were having a great time but we were melting in the high ninty degree weather. We decided to run into town for lunch and then head back to the pool for some swimming. Too bad neither of them know how to swim yet. This was his first time in the pool and he liked it. One thing I just love about Solvang is the beautiful architecture. I love that you can walk everywhere and see the whole city in a day if you wanted to. I love the little Christmas store and all the traditional danish decorations. There are tons of delicious danish bakeries all over town. There is a cool Hans Christian Anderson Museum. There is also a Hans Christian Anderson Square that has some little shops. One of them is a western cowboy general store that sells tons of cheap clothing. For some reason they have a surplus of left-over temple dresses back in the corner and I bought 2 new dresses for $5 a piece. They are the same brand as the one I bought at the distribution center for over $100. I have my 80+ year-old visiting teacher to thank for the tip as she was just there 2 weeks ago and bought some dresses. Like I said, such a beautiful town. My dad used to always bring us to the mission... so we had to stop by. This painted mural shows all the danish kings (or queens) from 900 A.D. to the present. And, of course, you've got to have windmills all over town. I make a lot of green smoothies. I like for there to be enough fruit to mask whatever vegetables I put in them. Last month I tried to make one with more vegetables in it and it tasted gross. I have wanted to try some with different vegetables like kale and cucumber but have been hesitant after that bad batch. I decided to try this verde green juice which had celery/kale/ginger/cucumber/apple/spinach in it. I actually thought it was pretty good and feel more motivated to try some new smoothies when I get home. Just look at all these cool buildings. Someone sure wants to be set free. Maybe next time we will get Hailey one of these. It would also be fun to take the trolley around town. We spent the rest of the morning strolling around town. 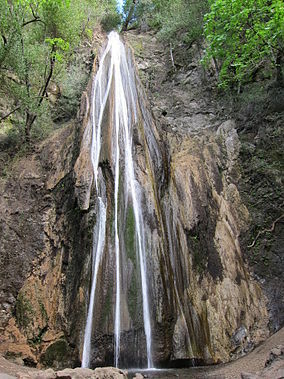 Nojoqui Falls about a 1/2 mile walk at one of the local parks.